Here is a chart for Wendy Davis, the Texas state politician who filibustered and stopped a rather severe abortion bill in her state this week. I don't know much about her, but the chart is instructive. On the libertarian side, she has Pallas ruled by Sun which is conjunct and parallel Mercury -- this is quite strong. Possibly chewing away at that strong ethical base is the South Node trine to that Sun and Mercury. 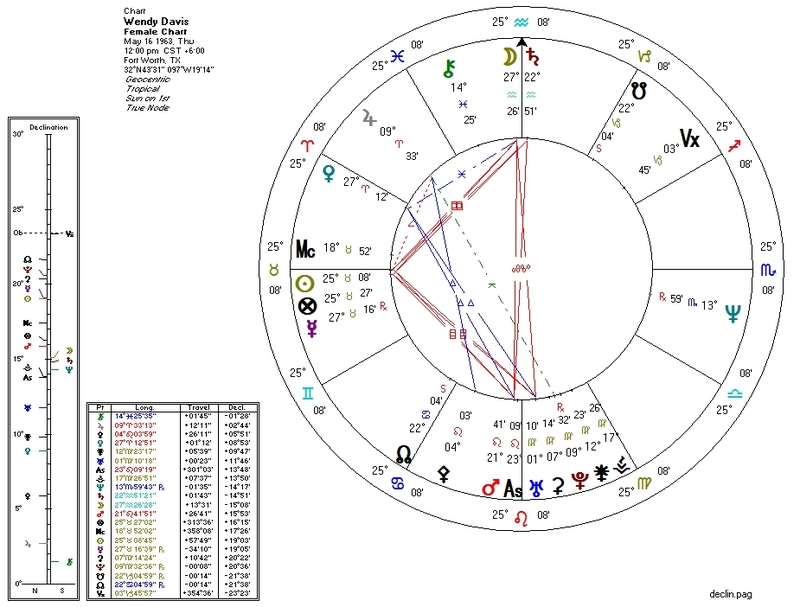 As with basically all liberals we have a Neptune-Venus connection: Neptune is quindecile (165 degrees) Venus and widely square her ruler Mars. Without a time of birth, we have to do some guessing about the Moon, arbiter of culture, which would tell us if Davis is a full-on liberal or some kind of social conservative. We can be pretty sure she's not the latter by reading the news. If the Moon is in Aquarius, then she is Neptunized by rulers Uranus (quintile Neptune) and Saturn (widely square Neptune). If the Moon is in Pisces, she is very probably sesquiquadrate Neptune, which also happens to be widely quincunx co-ruler Jupiter. Either way, Neptune (liberalism) wins over the Moon despite the North Node in Cancer. I would guess that the Moon is in Pisces, to put her in opposition with Pluto. 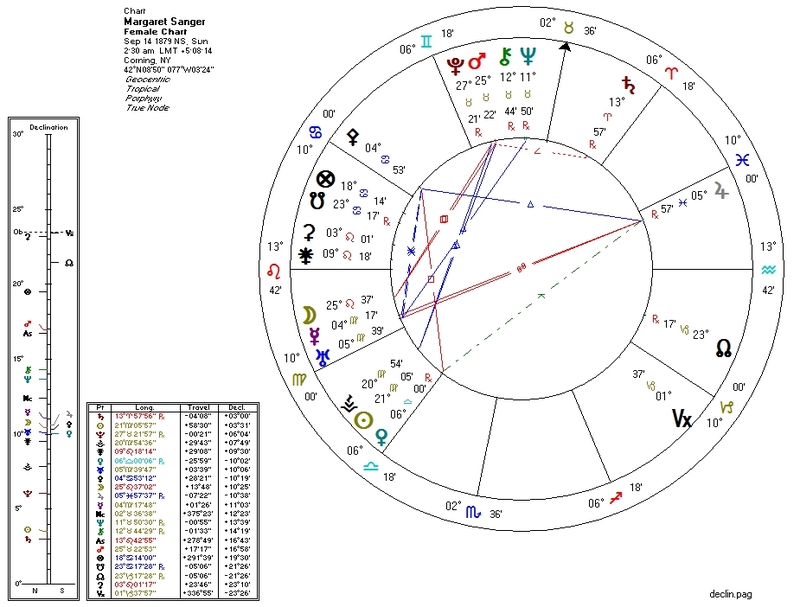 Research I plan to post later shows Pluto-Moon connections very common in feminist charts. With Davis' relatively strong Pallas, her activism on abortion is likely based on an honest belief that abortion is a human-rights issue. This is not the case with our next case. ...and boy, do we have racism. As the historically savvy know, Sanger was, unlike Davis above, not all that concerned with human rights. Abortion, for her, was about ridding America of "human weeds" (her words): non-whites. Sanger is, as are many, er, luminaries of the original Progressive movement, the beneficiary of a giant long-term whitewashing campaign. Today's Progressives are somewhat concerned with human rights regardless of race, and nominally anti-war. The original Progressive movement was fundamentally white-supremacist in the extreme, proudly anti-Catholic, and openly militaristic. They were today's "neoconservative" movement taken to a ridiculous extreme. Many institutions started by the early Progressives such as the minimum wage, abortion availability, women's suffrage, and the public school system were originally designed to allow the white Anglo-Protestant establishment to hamper the influence, power, and very existence of various minority groups. Margaret Sanger is very much a case in point. Sanger has, as does Davis, Moon-Pluto involvement. Pluto is square Sanger's Moon and trine her ruler the Sun. This is part of a possible chart signature for feminism, to be expounded in a future post.